2 Dodos in ARK: Mobile can be ridden if they are at least 2.4x in size. 3 Dodos can be bred for varying sizes in ARK: Mobile. The Dodo is one of the creatures in ARK: Survival Evolved. It is mostly used as a sort of 'chicken', making a large amount of eggs that can be eaten for a large amount of nourishment. Raphus replicare (more commonly known as the Dodo Bird) is quite possibly the dumbest creature I've ever seen in my life. It wanders around the beaches of the Island, pecking berries off bushes, and being eaten by all manner of carnivore. Without the Dodo, the whole Island's food chain would disintegrate. While it can be done, there is almost no reason to domesticate a Raphus replicare. It cannot carry enough to be a beast of burden, it does not provide much food, and it's too stupid to show companionship. It could work as a last-ditch food source, though, so I suppose keeping some around for "lean times" has a certain logic. Dodos aimlessly waddle about the beaches, hills and forests of the island, moving with little speed. When a Dodo is attacked, it will not fight back. Instead, it and any nearby Dodos will attempt to flee, although their slow movement speed usually makes them easy prey. Anything from a cluster of Compies to a single Spino will attack it and win unanimously. Even if the player takes an egg from a wild Dodo, it will not attack. Dodos will also occasionally get stuck on driftwood on beaches. A flightless species of pigeon, the dodo is easily identifiable by its large beak and stout, round body. Dodos vary in many colors. This section displays the Dodo's natural colors and regions. 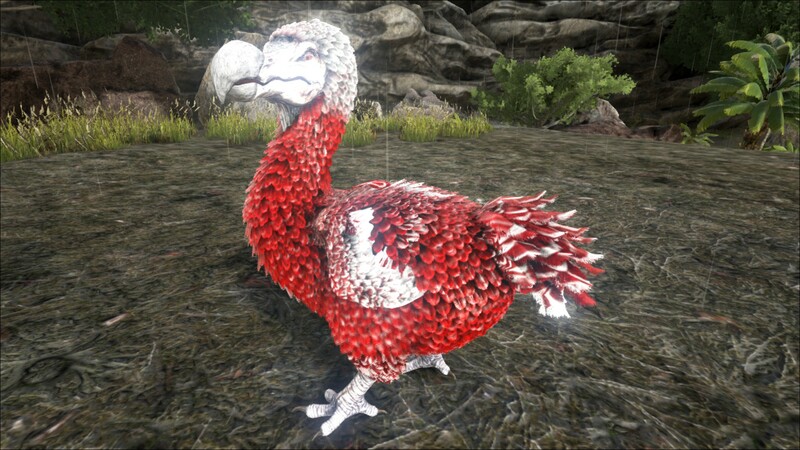 For demonstration, the regions below are colored red over an albino Dodo. The colored squares shown underneath each region's description are the colors that the Dodo will randomly spawn with to provide an overall range of its natural color scheme. Hover your cursor over a color to display its name and ID. For example, "cheat SetTargetDinoColor 0 6" would color the Dodo's "body" magenta. Dodos are easy to tame, you can easily knock them out with your fists or by using a slingshot to the head. A wooden club will also work. Or you may use a couple tranq arrows, though the higher damage may kill them. A Pulmonoscorpius can't K.O them because they are too weak but to help you should tame a lower level Pulmonoscorpius so it won't deal that much dp. This section describes how to fight against the Dodo. The dodo is a very small bird that makes chirping noises as it strolls throughout the beach. Once attacked, it will attempt to flee, but 1/3 times, it will attack you and then run away. This attack will damage little health, so do not worry too much unless your health is extremely low. They can easily be killed with a metal hatchet with one blow. Be careful in swarms, as they will all attack you if you provoke them. Aiming for the head will give a great increase in damage, causing the Dodo to be killed fairly quickly. Otherwise, aiming for the body will work. A single chomp by most carnivorous mounts (or a strike from a powerful herbivore) can kill them instantly. On occasion, strolling about with a Giganotosaurus or Brontosaurus can result in their death via the crush damage from the footfalls of your mount. They are so weak, swinging a Bronto's tail through the forest to collect berries can kill off entire groups of dodos. When hunting for dodos, throw a spear at their head to kill them in one hit. Use any sufficient weapon that will kill them in one hit to prevent other dodos from running away. As long as it's done correctly, they won't care if their buddy flopped dead in an instant. Fists can do the job, but a Spear in the head will almost always kill a Dodo in 1 shot. A Slingshot (suggested if the player has not unlocked or have the materials for any type of bow), or a Bow will finish off a dodo fairly quickly. Use a mount if you have one for an instant kill in most cases. Anything as strong or stronger than a Triceratops in terms of damage will kill a Dodo in 1 hit. It will run away from you at a fairly slow rate in an attempt to flee (usually to no avail). If there are any carnivores nearby, be wary of them, otherwise the Dodo is an easy meal. The Dodo bird is not a danger. Killing them can be easily accomplished with your fists, and they only do about 5 damage per attack. The Dodo's primary weakness is its unwillingness to fight back. The head is extremely easy to target, and as with most creatures, the most vulnerable body-part to damage. A thrown Spear or Stone Arrow in its head will usually take it down in one or two shots. Despite what is stated in the dossier, there are in fact many reasons why a Dodo should be considered as a worthy tame. Their broad utility is really quite surprising for such a simple, and early-on animal in gameplay, and they can continue to provide a positive result for your play-through experience even into the later stages of the game. Livestock: Because of the amount of eggs they produce, some tribes actually have Dodo farms; where they keep multiple tamed Dodos in an enclosed area, to collect any eggs they lay. While more demanding in effort, it is however, not necessary to use tamed Dodos in order to farm their eggs. To farm eggs with wild Dodos; build an open-roofed pen of wooden quality or higher that can be accessed through a door or a ladder, with enough space to air-drop the Dodo in with a flying mount. Proceed to collect multiple females (one male can be collected to help speed the process), then drop a tamed Oviraptor in that's set on wander, to spark egg production. 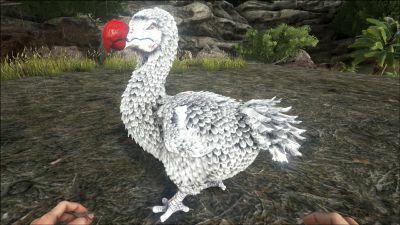 While you cannot breed the wild Dodos with this method or pick them up by hand, and with the cost of first requiring an Oviraptor, wild Dodos do not require you to feed them, nor do they count towards the Tribe Tame Limit. When it comes to farming tamed Dodos; they have one of the fastest breeding times of all creatures, making it easy to mass-produce them for both eggs and meat. Their fertilized eggs are very tolerant of fluctuating temperatures, and require almost no attention or temperature regulation to safely hatch in a temperate climate, such as the many beaches they can be found. Once born and given a little time to mature, a juvenile Dodo can yield a notable amount of Raw Prime Meat. Dodos also provide an excellent source of food for tamed Titanoboa; as said snakes will only eat eggs once tamed. The birds can keep up a reliable, steady supply to ensure the boas are well fed. Likewise, they are also a good source of eggs for taming Oviraptor, albeit their eggs are not the most effective compared to others, but they are more readily available. Live Prime Meat Storage: Any Dodo, wild or domestic, killed by a tamed Ichthyornis has a significant chance of yielding small amounts of prime meat when harvested. As prime meat has a fast spoil time, the Dodos can be kept alive up until when the prime meat is needed. If you are the type to utilize taming pens, a separate pen containing Dodos nearby can prove invaluable for speeding up the taming of carnivores. As many baby dinos do, when baby dodos are killed, they will also give prime meat. Tactical Warfare: While the notion of actually using a Dodo in a combat situation may at first seem laughable on the surface, they can actually fill many unique and surprising roles on the field of battle. Whether for the prospective raider, aspiring explorer, or staunch base defender; the Dodo can become a useful tool in anyone's creative arsenal. Walking Bomb: C4 can be attached to a Dodo in large quantities and the Dodo can be set to wander, then air dropped into an enemy tribe's base. If the dodo is attacked by aggressively defending dinos, the C4 goes off and kills it, same with any player that attempts to melee the Dodo. If the dodo is shot and killed, you simply have to Detonate. If nobody stops the Dodo, you can detonate it at your leisure. Breach Alarm: Setting a Dodo on aggressive and placing it in your base makes for a good alarm; as any raiders or wild predators that make it into your base will have to kill it as a result, thus alarming you on your screen while on trips away from home. Distraction: While seemingly an unimportant task, any predator that is eating your little flock of Dodos is not eating you. Whistle them to attack your target, run away, and tame a new flock. Good tactic for new players just getting their bearings. Living Storage: While not capable of holding a great amount of weight, Dodos make up for this by being able to hold onto a decent quantity of items in their inventory. They provide an excellent means of hanging on to any random items a survivor might want to keep early on in gameplay, and before storage boxes become available as a furnishing. Unlike their wooden storage counterparts however, Dodos can be picked up and moved if you feel you need to move your base location or adjust your build layout, which can happen many times in early gameplay. Ark Mobile Utility: Dodos can preform quite different roles on the mobile version than they can in the standard game. Cultivator: In ARK: Survival Evolved Mobile, a Dodo of 2.6x size or larger can be equipped with a Dodo Cultivator Bit which gives it the ability to occasionally obtain Vegetables from foliage. Raider: In ARK: Survival Evolved Mobile, a Dodo of 3.0x size or larger can be equipped with a Dodo Decimation Bit which gives it the ability to destroy any structure tier. In the dossier it says they are oblivious, but in real life, the island they lived on, Mauritius (found in the Indian Ocean), had no natural predators so they didn't know how to react to a hunter hence resulting in their death due to various factors : overhunting by the first Dutch settlers, pests like rats, which were accidentally brought on the Island by the first Dutch, would destroy the single egg laid and natural hazards also contributed to their downfall from one of the once most abundant animals to an extinct species. Their walking speed is terrible which makes it hard to move them around, most of them can't even outrun player with only 100% speed. However, they have a decent swim speed which can be used to cover larger distances quicker. Since the v241, The best way to move them is to pick them up in your hands and toss them, but you can't hold a tool or weapons while doing so. In ARK: Fear Evolved, there is a zombie variant of the dodo that spawn near the DodoRex. This Zombie version is more aggressive and will attack the player. The Dodo is a vector of the Swamp Fever. Dodos are very easy to tame and their eggs are used to make kibble for both the Pteranodon and Ichthyosaurus. This gives young survivors/tribes easy access to quick flight and aquatic travel. Such access to both natural resources and supply beacons greatly increases one's capabilities. Even the strongest of tribes may begin with the simple Dodo! Despite not having a favored kibble when taming, like other creatures Dodos are no exception when imprinting. They occasionally desire one of the Kibbles from the imprinting kibble list as their 'Comfort Food'. If dodos are bred to extensive numbers it can cause server-performance issues. As of v1.1.16 (the Dodo TLC for ARK: Survival Evolved Mobile), Dodos can be bred for varying sizes. Tamed Dodos will randomly drop Dodo Feather on the ground which can be used to craft various items (the Dodos must be tamed after v1.1.16). Dodos of 1.56x size or larger drop Dodo Feather. Dodos of 0.8x size or larger cannot be shoulder mounted. Dodos of 1.4x size or larger cannot be picked up. Dodos of 2.4x size or larger can be ridden. Dodos of 1.86x size or larger will get a "Rage" buff that enables them to deal double damage and gain double speed when they are whistled to attack a target. They also receive an Alpha glow. 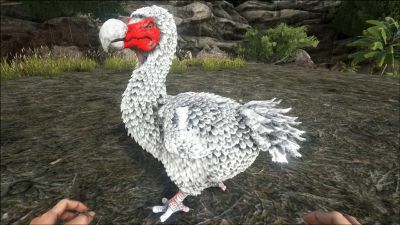 Dodos of 3.47x size are able to perform a "smash" where they will slam themselves onto the ground and stun any Creatures in the area. 3.5x size is the max Dodo size. 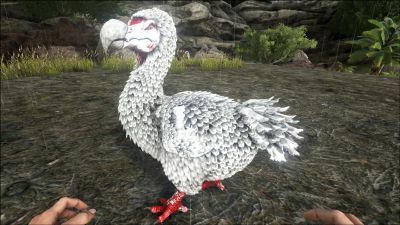 Dodos of 2.0x size and above have a maturation speed of about 3 days. Dodos of 3.0x size and above have a maturation speed of about a week. Dodos may gain or lose up to .1x size when bred, though it is possible to get a size mutation, and Dodos may gain or lose up to .4x size.